Water's Edge Counseling is conveniently located on the southwest corner of 37th Street and Bull Street. The office is on the top floor of a beautiful, blue Victorian home. There is plenty of parking along Bull Street or around the corner on 38th Street, west of Bull Street. 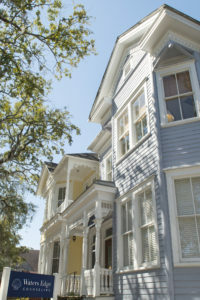 Many SCAD students walk to the office from their homes. 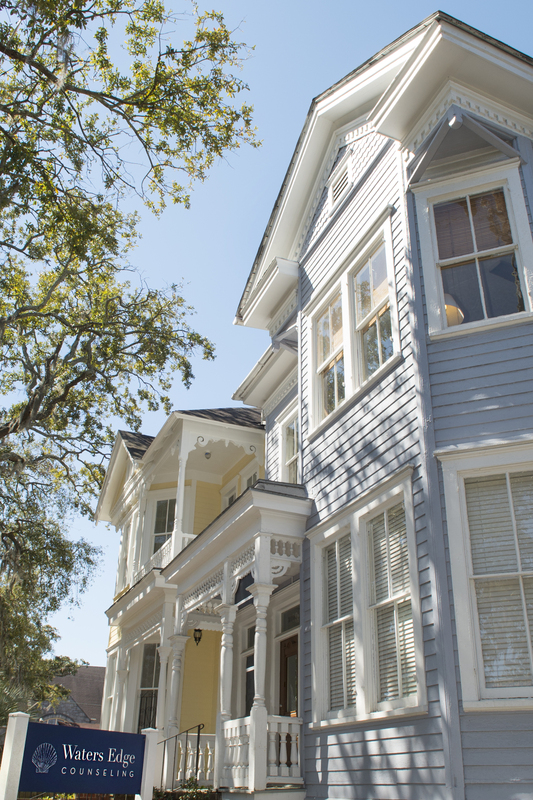 Other SCAD students take the bus to Arnold Hall. The office is a couple of blocks south from Arnold Hall. To make an appointment, please contact us at 912-319-5552 or send an email to christina@watersedgecounseling.com I offer consultations for those interested in counseling but have further questions before making an appointment. Another way to contact us is by simply completing the form below. We will respond within 24-48 business hours. Water's Edge Counseling sees clients on a self-pay basis. The cost for counseling services varies depending on the knowledge and experience of your clinician. Sessions are 45-50 minutes in length and range from $90-$125 per session. Some clinicians offer a sliding scale, which can be discussed at Intake. Though we are not in-network with insurance providers, you can chose to file with your insurance and request reimbursement for an out-of-network provider. We are often asked why we are not in-network with insurance. We believe confidentiality is of the upmost importance in working with clients. Therefore, we have chosen not to work with insurance companies for a number of reasons. First, when filing insurance, companies require that clients are given a diagnostic code for billing, even if a diagnosis may not be appropriate. By not billing insurance, we can meet client needs without labeling the mental illness for an outside company. A second reason we do not bill insurance is confidentiality. Most insurance companies require that clinicians file by using an Electronic Medical Record. By releasing private information to a third party or insurance company, it increases the risk of client's information being exposed. Also, if you or your child needs a federal background check such as joining the military, wants to be a pilot, or for a number of other reasons, their personal information may be obtained through insurance. We want to offer the highest protection of your private mental health information. Third, rather than allowing insurance companies to dictate your treatment, we want to have a collaborative process with you in regards to your treatment. For example, some insurance plans choose the length of treatment, number of sessions, or duration of sessions. By not filing insurance, your counselor can offer the most effective treatment as opposed to allowing insurance to determine treatment options. We want to give you the most confidential and best quality of counseling!